Students will be able to practise relaxing their body to notice how it feels. Students will be able to make connections between relaxation and mindfulness. Ask the students what it means to feel relaxed. When do they feel relaxed? What helps them feel relaxed? Have students share what relaxation means to them, and examples of when they feel relaxed. Explain that today you will practise an exercise for deep relaxation, and make connections to mindfulness. Review the term MindfulnessAs necessary: "Paying attention to what is happening right now." Explain that you will first practise relaxing different parts of your body before a deep, full relaxation. Ask the students if they have ways to relax their body. If helpful, you can ask, "What is the opposite of relaxation?" (Tension.) "What does it feel like to be tense?" Explain that you will practise feeling both tension and relaxation. As a class, you will explore the difference between the two by focusing on different body parts to tense and then release. Ask students to stand up, with enough space around their body to move freely. Explain that together you will tense different parts of your body (make them tight), then shake them out and let them hang/release. Demonstrate with your hands. Make your hands into tight fists and squeeze. Have students join you in making fists and squeezing. Then release, shake them out, and let them hang relaxed. Next, hug your arms tightly into your body. Then release, shake them out, and let them hang relaxed. Next, try tensing your facial muscles, scrunching them in tightly to make a funny face. Then release and relax your face. Squeeze your shoulders up toward your ears; try to touch them to your ears. Then release them down, shake them out, and let them hang relaxed. Curl your toes up inside your shoes. Then release and wiggle them out. Take several student suggestions of other body parts to tense and release. While students remain standing, describe what visualization is: Words that help you go into your imagination with your eyes closed.Give a short preview of what is to come. For example, "I will ask you to lie down and close your eyes. I will read some words, and your job is to listen closely to what I say. You only need to relax your body and listen." Ask the students to spread out in the room and lie down. Remind students that for right now, all they need to do is close their eyes, relax their body, and listen to your words. If desired, ask students to tense/tighten their whole body and then let go before you begin. Use the chime to mark a period of silence for students to just feel their body in full relaxation. After several minutes (use the timer, making sure it is silent), explain that you will sound the chime again. When they don’t hear the chime anymore, they can slowly wake their body and sit up where they are. Ask students to share how they feel. Preview the Deep RelaxationWorksheet together as a class. 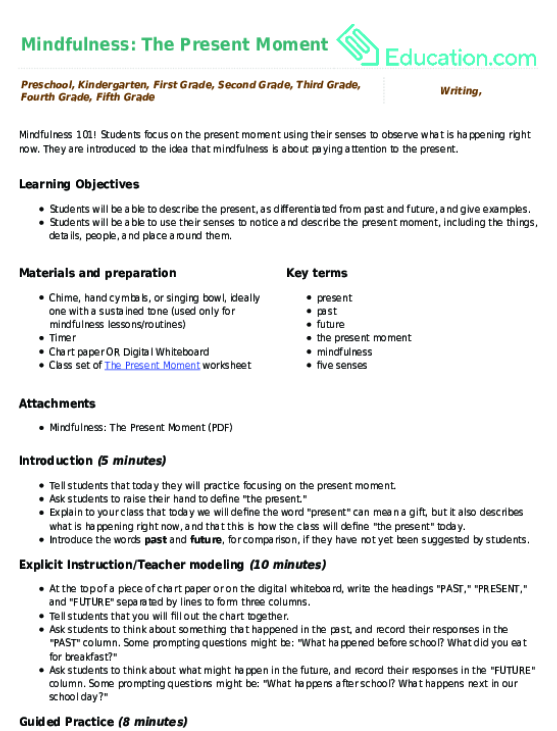 Have students write their own visualization for relaxation on the back of their worksheet. Encouage them to think of creative ideas to help relax the body. Ask students to discuss in pairs how deep relexation made them feel. As a follow-up, ask students to think about mindfulness: paying attention to what is happening in the moment. "What are the connections between mindfulness and relaxation?" Students share their thoughts on the connections between mindfulness and relaxation. 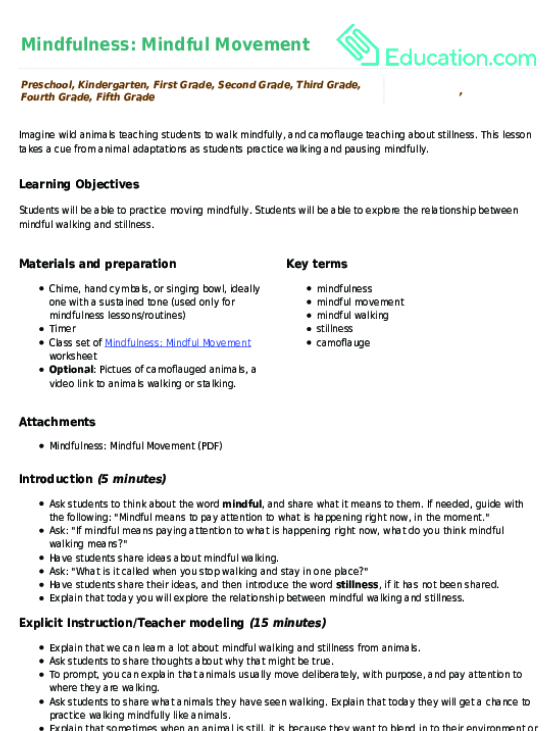 This worksheet will help students reflect on their deep relaxation experience. This lesson encourages students to look at, listen to, and feel what is happening on the inside through practising mindfulness.